Quite a few years ago, friends told me that I should be studying gerontology and geriatric medicine because the disciplines represented the future. Geriatric medicine turned out to be my future. At the age of 50, I completed a postdoctoral fellowship in geriatric medicine. During that time, I received many stares and sideways glances. But it was fun. 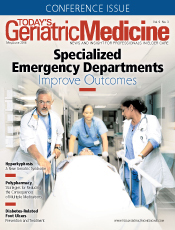 Geriatric practice combines the science and the art of medicine. Then several years ago, I read the quote, "To hear the voice of the voiceless, one must be silent before him" (Fenelon, 17th century France). To begin to hear, I joined the patients in the nursing home sitting areas. The patients didn't offer complaints. They were concerned about me. One woman asked, "Where's your hat?" I asked, "What?" She explained, "It's snowing; you need a hat." Another offered to replace the missing button on my white coat. Another wanted to make sure that I saw the turkeys. My first thought was that she was hallucinating. But looking outside, I saw that there were turkeys walking down the path. From there, in order to create connections with patients I began to practice what I call "creative rounding." Several interventions involving music, visual arts, and writing have proven beneficial. One resident was upset about leaving her friend. I asked, "What can we do so that you feel a little better right now?" We sang the opening lines of "Una Furtiva Lagrima" and "Là Ci Darem La Mano." One voice was failing and the other voice was off key. But we had fun. After our singing, she was able to smile and tell stories about the days when she sang professionally. One day I was paged when staff members worried that a resident would climb out of bed. She said a few words but we could not understand the meaning. I remembered that she enjoyed listening to music and dancing. I found a CD of Duke Ellington music on the nightstand. Once it started playing, her feet were moving as if tapping and her fingers trying to snap in time. Everyone breathed a sigh of relief as we also started to finger snap and toe tap. Another time a resident declined to meet with me. He said he didn't have a problem and didn't need a physical examination. He grumbled and became agitated. I quickly scanned his bookshelves. I chose a book on Assisi, Italy. We looked at images of the town, the church, and frescoes of Saint Francis. On the last page was the Prayer of Saint Francis, "Make Me an Instrument of Your Peace," which we read together. By then, he was calm and peaceful, and I was able to complete the examination. Treating elderly patients requires special considerations. The American Geriatrics Society (AGS) supports the Choosing Wisely campaign when pursuing the evaluation and treatment of medical conditions. The AGS recommends against physical restraint, antipsychotic medication, and benzodiazepines as a first choice for managing behavior issues in patients with dementia and delirium. It also supports following the Beers Criteria for prescribing medications. The elderly are at risk of experiencing more frequent and more severe side effects from medications. However, the elderly are most likely to be the patients requesting these medications. For example, oxybutynin, used for urinary incontinence, is on the Beers list. Regulatory agencies and surveyors monitor the use of antipsychotic medications to manage resident behavior. Gone are the days of ordering multiple doses of Haldol and walking away. The importance of creative rounding is that it helps me comply with the AGS's recommendations in delivering appropriate care to my patients. It reminds me of the days when there was time to hold finger thermometers to demonstrate the use of biofeedback or relaxation breathing to relieve headache. It reminds me of the time when medicine was about a person rather than a regulation or scorecard. — Ritamarie Moscola, MD, MPH, CMD, CPE, practices geriatric medicine and hospice medicine in Manchester, New Hampshire. She presents workshops on arts and health care both locally and nationally. In 2015, she was awarded Best in Class: Art Application by the Family Medicine Education Consortium. In 2014, she was recognized by Today's Geriatric Medicine as a Professional of Note and was named a Featured Artist by The Art Connection in the Capital Region.